🗽 Good Giving Tuesday morning from New York. 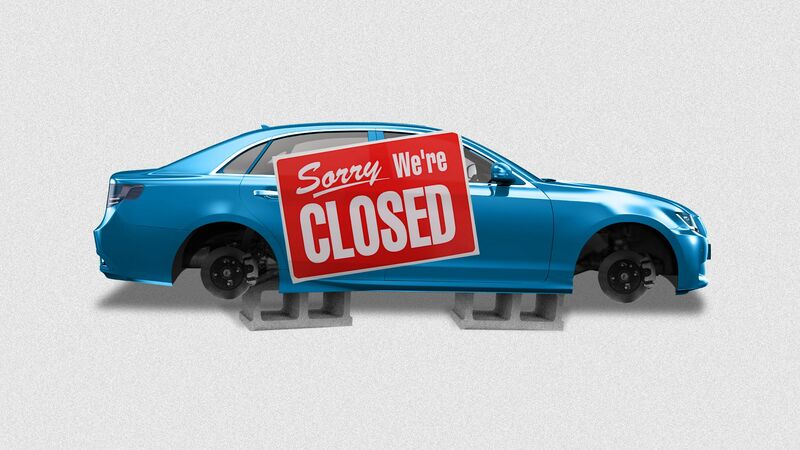 Welcome to the modern car industry, which is full of bad news, report Axios' Felix Salmon in New York and Joann Muller in Detroit. How it's playing ... Financial Times front page, "GM deals blow to Trump heartland" (subscription). Bots spreading misinformation are using more sophisticated techniques, like going after specific human influencers and targeting misleading information within the first few seconds of it being posted, Axios' Sara Fischer reports. Why it matters: New studies suggest that bots are getting more adept at gaming social platforms, even as the platforms are making changes to weed them out. Bots are also getting better at avoiding detection. Be smart: This is the future Elon Musk warned us about Sunday on "Axios on HBO." Focus on speed: The spread of low-credibility content by social bots happens very quickly, according to a new study from Indiana University published in Nature Magazine. Using specific targets: Bots increase exposure to negative and inflammatory content on social media in part by targeting specific people, according to a new study from the Proceedings of the National Academy of Sciences (PNAS). Elevating human content: Bots aim to exploit human-generated content, because it is more prone to polarization, according to the PNAS study. Targeting original posts, not replies: Bots spread low-credibility content that is created through an initial tweet or posting, according to the Nature study. Gaming metadata: Bots are using more metadata to mimic human behavior and thus avoid detection, according to a new study from Data & Society, which receives funding from Microsoft. As platforms get better at detecting inauthentic activity, bots are using metadata — photo captions, followers, comments, etc. — to make their posts seem more human-like. What's next? Social platforms have been trying to reduce the content-elevating signals that are easily gamed by bots. Twitter, for example, has made follower counts appear less prominent on its iOS app by making the font size smaller in a new redesign effort, per The Verge. Former Trump campaign chairman Paul Manafort continued to repeatedly lie after his plea agreement, special counsel Robert Mueller said in a stunning filing last evening. "Prosecutors ... said Mr. Manafort’s 'crimes and lies' ... relieve them of all promises they made to him in the plea agreement. But under the terms of the agreement, Mr. Manafort cannot withdraw his guilty plea," per the N.Y. Times. Why it matters, from WashPost: "Mueller’s team may have lost its potentially most valuable witness." MSNBC's Chris Hayes said this "sure looks like a last-minute play to be pardoned." Ron Klain added later on MSNBC that we're "one step closer to a constitutional crisis": If Trump pardons Manafort, "that really is smack dab in the middle of a president essentially pardoning himself for cooperating with a foreign power in the presidential campaign." "The crescendo is building. The music is rising here. We're headed to something very significant here in the next few days." P.S. ... N.Y. Times, 45 years ago today: "President Nixon's personal secretary, Rose Mary Woods, testified in Federal District Court in Washington that through some 'terrible mistake' she had pressed the wrong button on her tape recorder and thus caused an 18‐minute 'gap' on one of the subpoenaed Watergate tape recordings." 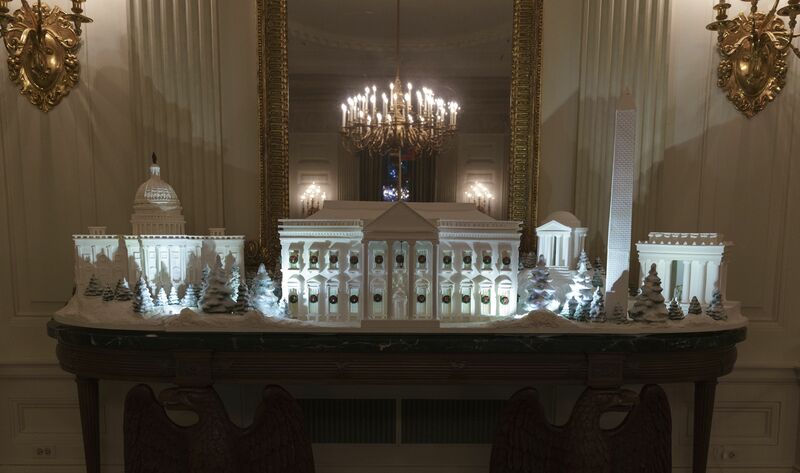 The White House's Christmas decorations, unveiled yesterday at a press preview, include this gingerbread house in the State Dining Room, showcasing the full expanse of the National Mall — the Capitol, the Lincoln Memorial, the Jefferson Memorial and the Washington Monument, plus the White House. The pastry sculpture includes 225 pounds of dough, 25 pounds of chocolate and 20 pounds of white icing, per AP. "A better image came hours later and more are expected in the days ahead, after the dust covers come off the lander's cameras." "The spacecraft arrived at Mars after a perilous, supersonic plunge through its red skies that took just six minutes." "'Touchdown confirmed!' a flight controller called out just before 3 p.m. EST, setting off jubilation among scientists at NASA's Jet Propulsion Laboratory in Pasadena, Calif., who had waited in white-knuckle suspense for word to reach across 100 million miles of space." "Because of the distance between Earth and Mars, it took eight minutes for confirmation to arrive." 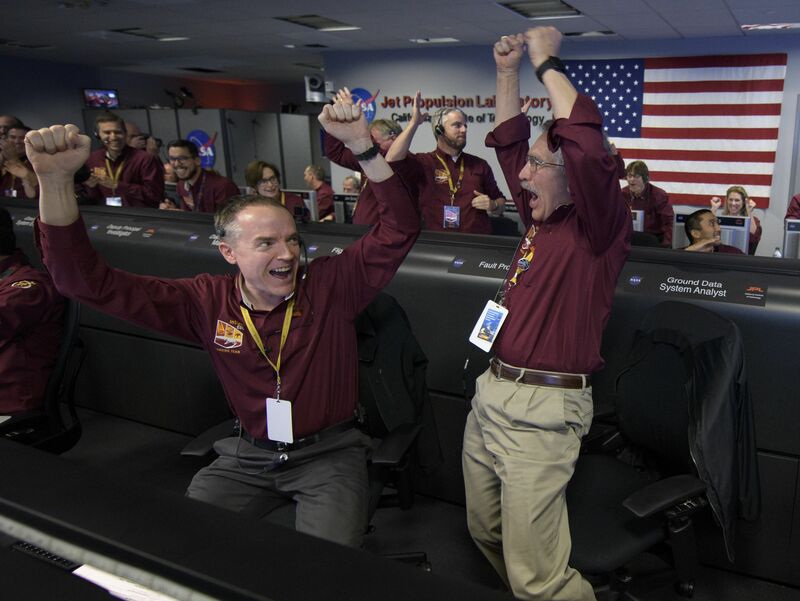 At the Jet Propulsion Lab, InSight team members Kris Bruvold (left) and Sandy Krasner cheer after receiving confirmation that InSight touched down. Ahead of this week's G20 summit in Argentina, it's clear from an interview President Trump gave The Wall Street Journal — and from our own reporting — that his faith in tariffs is as strong as ever, per Axios' Jonathan Swan. Trump believes to his core that tariffs work, both to create negotiating leverage and as instruments to improve the U.S. economy, though it's hard to locate many economists who agree with Trump on the latter point. WSJ's Bob Davis: "[T]he Chinese No. 1 goal in this G-20 is to get you to delay or suspend that [increase in the tariff rate on some Chinese imports from 10 percent to] 25 percent on January 1. ... [A]re you willing to do that?" Trump, who’ll meet Chinese President Xi Jinping at the summit: "I think it would be highly unlikely." This suggests that, as Trump has been telling people he talks to regularly, he doesn't expect a breakthrough. A breakthrough would mean any kind of deal — even a temporary one — to stop Trump from ratcheting up China tariffs in January, as he’s scheduled to do. 8. New test for Trump: Confront Putin? 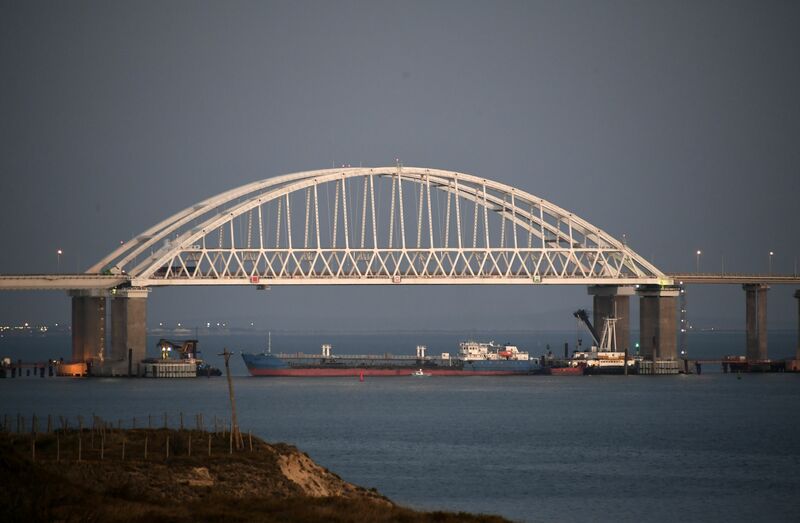 "Ukraine’s president put his nation on a war footing with Russia ... as tensions over a shared waterway escalated into a crisis that dragged in NATO and the United Nations." The big question: Will Trump say anything about Russia taking its aggression even further? 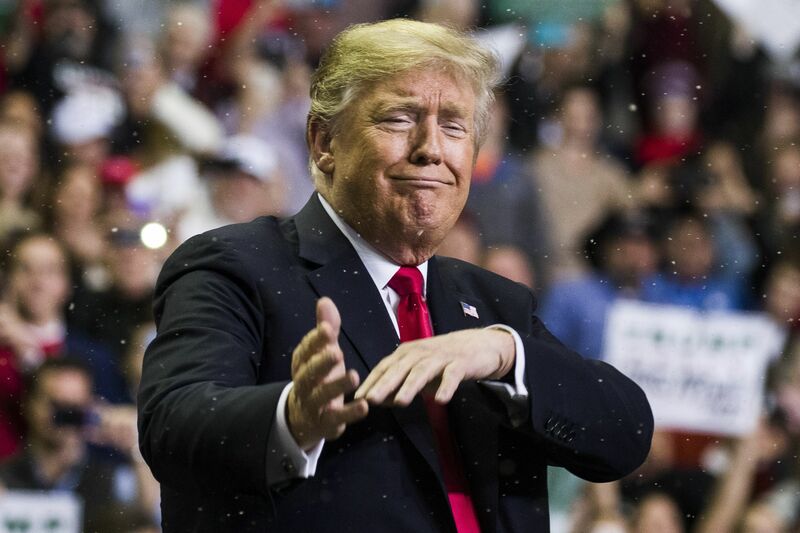 Or will he normalize this rogue behavior? 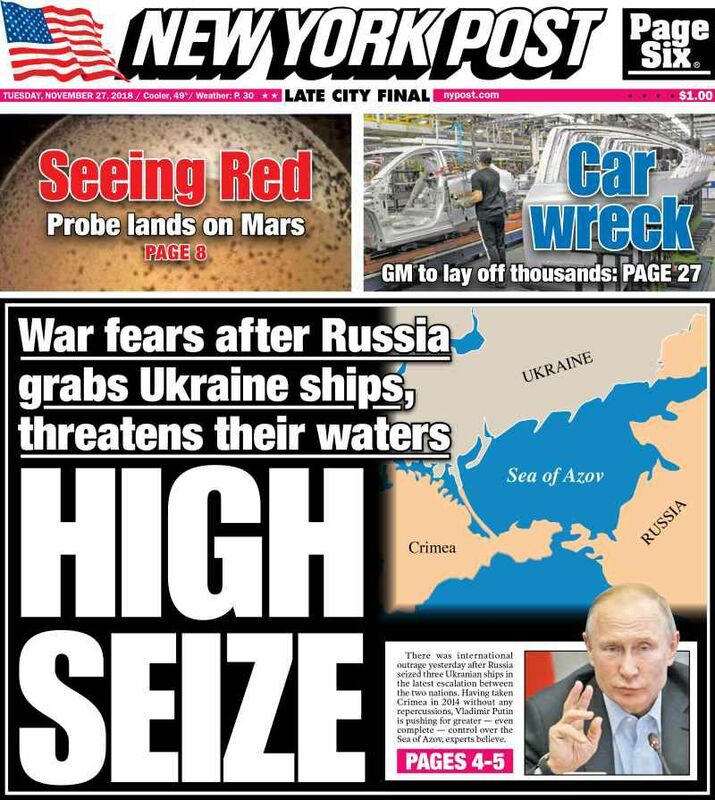 The pressure from the national security establishment will be to call out Russia, while Trump's own instincts tend to favor Putin. Launching at 7 a.m. ET today ... Fox Nation, an on-demand, subscription-based service ($5.99/month) that will include a weekly video from conservative social media stars Diamond & Silk. Axios media trends expert Sara Fischer says Fox News joins a very competitive field in the conservative news-streaming space. But the reality is that this is an experiment for the Murdochs, who have successfully launched streaming services elsewhere around the globe. Isabella talks about his lifelong struggle with alcohol: "I’m an alcoholic drug addict. You know, I am. I’ll always be for the rest of my life." In early spring, Isabella had a panic attack that sent him to the hospital. He says he’s stayed "pretty much" sober since. It became habit for bartenders at Isabella’s restaurants to water down his drinks. "We would have to basically trick him," says a former manager. Deals from developers and money from a new generation of investors allowed him to expand so fast that the company’s infrastructure couldn’t keep pace. 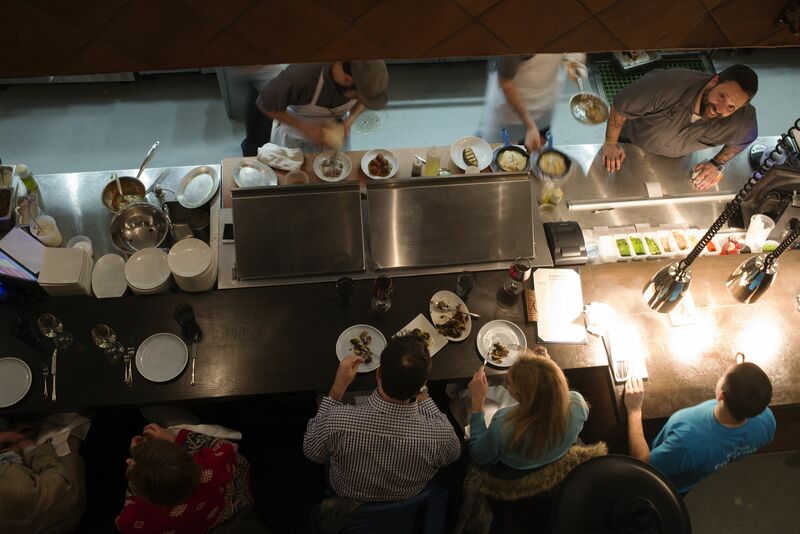 The restaurant group was run in large part like a small family business governed by Isabella and his entourage, and didn’t hire an H.R. representative until last October. The suit created a rift between Isabella and his partners, George and Nick Pagonis. A former manager says they stopped talking. The two factions are now at odds over who will control the company.